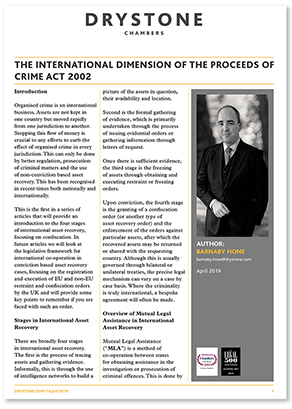 The following article by Barnaby Hone is the first in a series of articles designed to provide an introduction to the four stages of international asset recovery. Future articles will deal with the legislative framework for international asset recovery, focusing on the registration and execution of EU and non-EU restraint and confiscation orders by the UK. Barnaby has a wealth of experience in fraud, international asset recovery, financial crime and professional discipline law, particularly in healthcare and sports law matters. He has experience of all areas of the Proceeds of Crime Act both domestically and internationally. In addition to his busy practise, Barnaby writes the chapters on International Asset Recovery and Terrorism Finance for Millington and Sutherland Williams on POCA and recently completed a series of seminars and articles on changes to POCA under the Criminal Finance Act 2017. Barnaby is ranked in the Legal500 as a ‘leading individual’ in POCA and Asset Recovery law.